Located 45 minutes west of Austin, Texas, Arrowhead Ranch Subdivision is a master-planned community on 362 acres in Dripping Springs. The property was divided into 259 lots for single-family homes and boasts beautiful views over the high bluffs overlooking Onion Creek and Creek Road. Residents at Arrowhead Ranch enjoy a hill-country theme community with central amenities focusing on an active, outdoor lifestyle. During Phase 1 of construction, a structure was needed at the entrance to the subdivision. To avoid the cost and time associated with U.S. Army Corps of Engineers permitting for a sensitive waterway, Doucet and Associates, Inc. (D&A), the project's engineer, needed an innovative solution that could be installed quickly and cost effectively. The installation schedule proposed by the developer required that the design and bid processes occurred simultaneously. Consistent communication with D&A and the ability to service the project outside of a typical schedule allowed for a successful and competitive bid from the contractors, DNT Construction, as well as a simple and efficient design and review process. Due to a past relationship with Contech Engineered Solutions, D&A turned to Contech for help in accomplishing their goals. 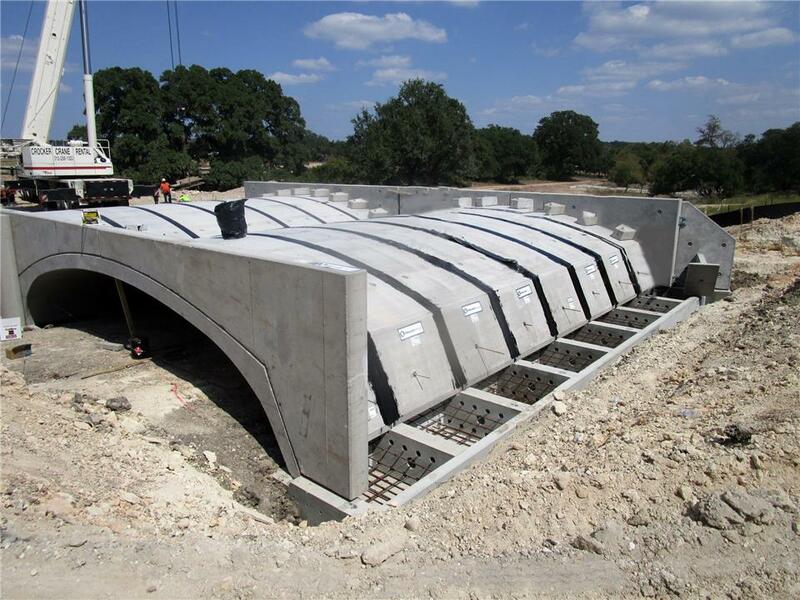 In the end, D&A decided to utilize a twin cell 32'-6" x 6'-4 1/8" CON/SPAN® O-Series® Precast Bridge System, 48' in length, for its cost effectiveness, quick installation and clear span. A twin cell structure was required. The first cell avoided impacting the jurisdictional waters while the second added additional hydraulic capacity. Overall, the modular, precast system included 16 arches, four headwalls and four wingwalls. To further expedite the installation, the CON/SPAN structure was placed on 6' wide x 2'-6" thick x 50'-11 3/4" long (outside) and 7'-6" wide x 2'-6" thick x 48'-11 3/4" long (inside) precast EXPRESS® Foundations. The precast structure offered a number of advantages over alternative solutions, including: the aesthetic look of the natural, twin cell arches, a better water-tight joint option and the ability to use EXPRESS Foundations. "The support, technical advice and on-site consultation during installation provided by Contech made the entire process painless and allowed us to provide a cost effective and aesthetically pleasing structure to our client," stated Jennifer Dermanci, Project Manager with D&A.